Do You Feel a little funny? Over 50 Minnesota cartoonists made the deadline for Lutefisk Sushi Volume D… you can see the list of contributors here (note if you contributed and do not see your name on that list, please let us know). Whether or not you made that deadline, there is another way you can participate in the Lutefisk Sushi Volume D show. The show will also include a vending machine filled with boxes of teeny-tiny minicomics, and you do not even have to live in Minnesota to make one! 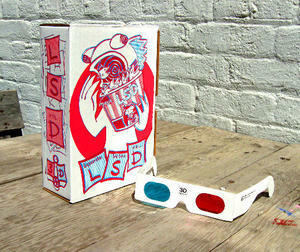 little funny series II is intended as a prominent “sideshow” to the Lutefisk Sushi Volume D project. 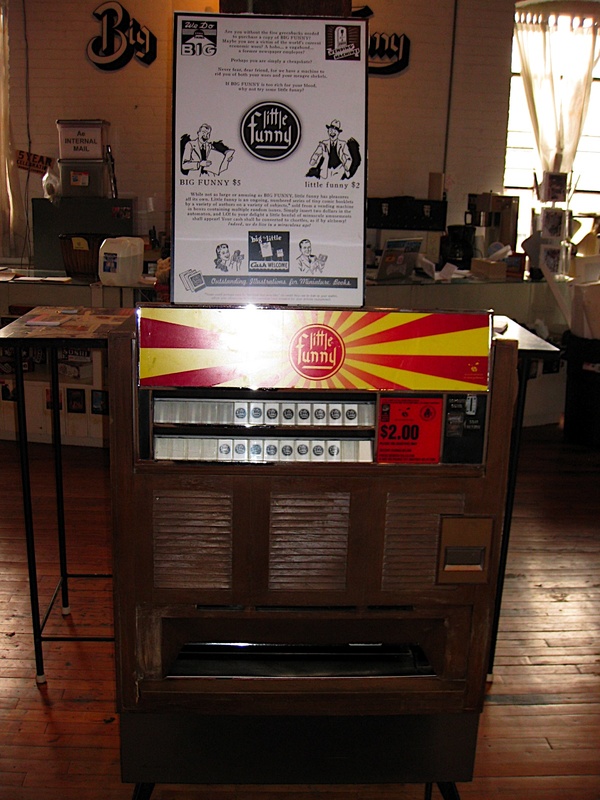 little funny is a series of mini-comics sold in an old cigarette vending machine at Altered Esthetics. 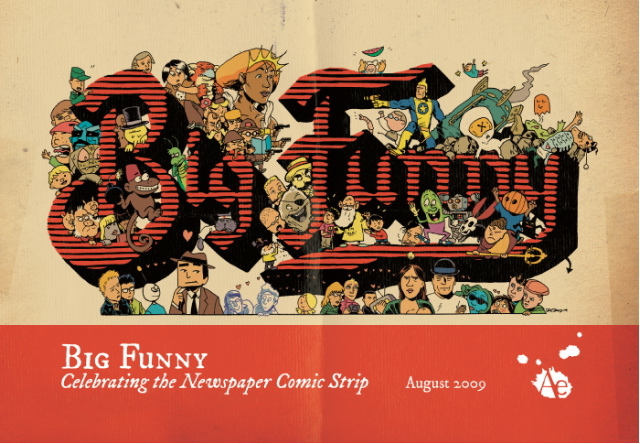 The first series was compiled in conjunction with the BIG FUNNY show in 2009. The deadline for participation is JULY 22nd. Read more about how to participate in little funny series II here. 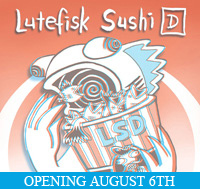 little funny series II is intended as a prominent “sideshow” to the Lutefisk Sushi Volume D project. 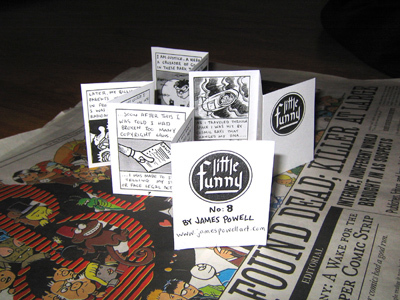 little funny is a series of mini-comics sold in an old cigarette vending machine at Altered Esthetics. The first series was compiled in conjunction with the BIG FUNNY show in 2009, and it is almost sold out… it is time to restock the machine. No entries will be rejected provided they follow the specs (these comics need to be a specific size to fit inside the boxes in the vending machine). You do not have to be a Minnesota artist to participate. Additionally, we have a limited number of vending slots available for people who would like to vend a non-little funny comics project from the machine. All projects will need to fit in a 3” x 2” x 1” box. Email tonytudisco (at) alteredesthetics.org for more information on this opportunity. Email us at webmaster (at) cartoonistconspiracy.com for an issue number. little funny is an ongoing numbered series. Make sure to put your number on your comic. If you choose to do multiple issues, you’ll need a number for each different issue. Draw your comic. Make sure to sign your work and include your contact info on it. Make 50 or more copies of your comic. The only requirements for the comic are that it fit in the 3” x 2” x 1” box, and that it have the title little funny and the issue number on the cover. You can get the little funny logo here, if you are inclined to use it. A template is available, but is not required. One double-sided copy of the template makes three copies of a 10-page accordion style micro-comic with two covers (or, alternately, 3 different issues). DEADLINE FOR PARTICIPATION IS JULY 22nd. Participants names will also appear on the Lutefisk Sushi Volume D website as being a part of the little funny show. Comics may be color, or black and white, or on colored paper, or decorated with glitter glue, or painted or whatever the hell you want to do as long as they fit in the box. Two complete sets of all the comics will be kept for the Conspiracy archives. Can’t afford BIG FUNNY? Well, how about some little funny? I just put up a gallery of photos of all the issues in the little funny sideshow, which you can see here. 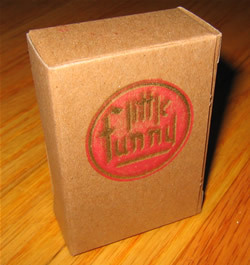 little funny is an ongoing series of mini-comics boxed and sold out of an old cigarette vending machine. The little funny set 1 box sets each contain 6 accordion-style mini-comics. The 6 comics in a set 1 box are randomly selected from the 29 issues in the first set. Boxes sell for $2 each. They are only sold out of a vending machine currently housed at Altered Esthetics gallery. 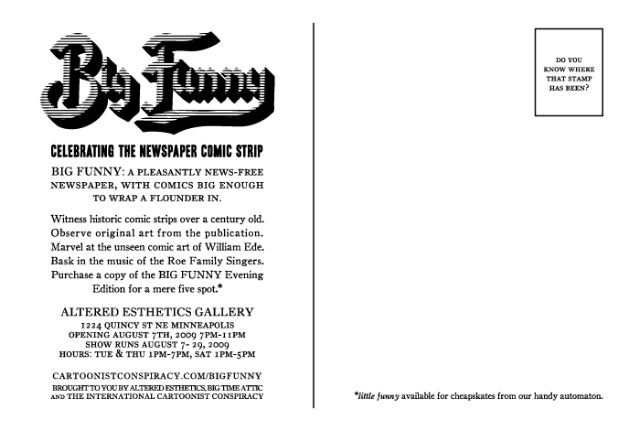 They will make their premiere at the BIG FUNNY show opening this Friday, August 7th, 2009.